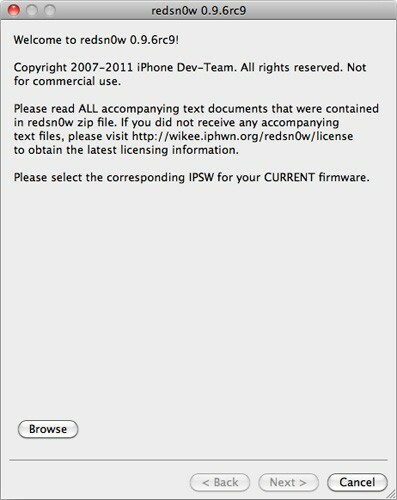 If you've been waiting for a nice, easy jailbreak solution for iOS 4.3.1, then today's your lucky day: Dev-Team's just released redsn0w 0.9.6rc9 for both Windows and OS X, allowing us mere mortals to free our supported devices -- iPhone 3GS, 4 (GSM); iPod touch 3G, 4G; iPad 1; and Apple TV 2G -- with a few simple clicks. Alas, there are a couple of caveats: the iPad 2 isn't supported here, as Cupertino has somehow managed to tighten up its security to fend off hackers (for now); and ultrasn0w users have also been told to hang tight until there's a compatibility fix -- Dev-Team will announce on Twitter when this becomes available. As for those who are eligible for this new jailbreak, head over to Dev-Team's website for the download links, and make sure you have the corresponding IPSW files handy as well -- you can find them over at iClarified or on your favorite search engine.